Scattered throughout London are small green sheds which, as you approach them, are often bathed in the smell of fresh coffee and cooking bacon. Positioned at key locations in the Capital, these wooden buildings were constructed to provide shelter and hot food for the drivers of hansom cabs and hackney carriages (taxis). To pay for the shelters a charity was formed in 1875 by The 7th Earl of Shaftesbury called the Cabmen’s Shelter Fund. The registered charity number is 236108 and was registered with the Charity Commission on 27 September 1966. Between 1875 and 1914, the fund built a total of 61 shelters at cost of around £200 each. These shelters were all positioned within a 6 mile radius of Charring Cross. Because the shelters stood on a public highway, the police stipulated they could be no larger than a horse and cart. Yet even with these restrictions, they squeezed in a working kitchen and seated up to 13 men. 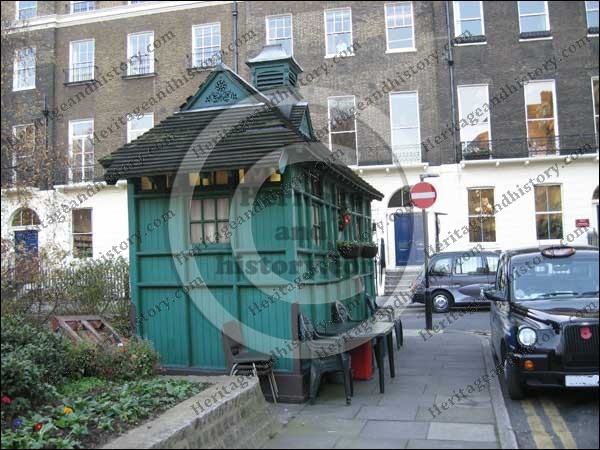 Today, there are 13 cabmen’s shelters surviving in the capital, all of which are Grade II listed buildings. Cabbies bought their own mugs, which were kept for them at the shelter and looked after by the ‘shelter boys’. The shelters are run by tenants who pay a contribution to the Charity to maintain the shelters. The Russell Square shelter spent most of its life in Leicester Square, once a major stopping point for taxis. When pedestrianisation arrived in the late 1980s, the shelter became obsolete and was moved to Russell Square. On the green painted door are two plaques. 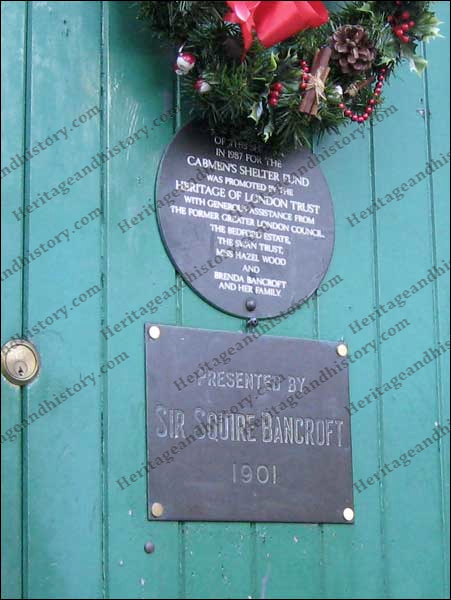 The lower of the two indicates that the shelter was presented by Sir Squire Bancroft in 1901. He was an English actor and manager. It is said that the first shelter was erected in 1875 and paid for by Sir George Armstrong, a newspaper publisher, after his servant was unable to find him a cab on a blustery January day. Whilst 13 shelters exist in London a number of similar shelters exist elsewhere. In Ripon, in North Yorkshire, a shelter was was bought in 1911 with a £200 legacy to provide a shelter for cabmen waiting for fares on Ripon’s Market Square. Four cabmen’s shelters were opened in Portsmouth according to an article transcribed from the Hampshire Telegraph, 24th April 1876. In Albany, Australia is located a Taxi Rank and Women’s Rest Room, formerly the Cabmen’s Shelter and Women’s Rest Room, on Reserve 19464 at the foot of York Street. St. Giles in Oxford . An appeal was launched for the first cabmen’s shelter in St Giles in October 1875, and a committee was formed in December that year with the aim of making the shelter “worthy of the place which it is to occupy”. Market Place cabin in Hitchin. This Edwardian Cabmen’s Shelter used to stand on the forecourt of Hitchin Railway Station and was paid for by the donations of rail users collected by Edward Boxall who ran a cab business from The Red Lion. Do you know of others? Let us know about them using the comments section below.